1. Do You Really Want To Hurt Me? 2. Do you Really Want To Hurt Me? 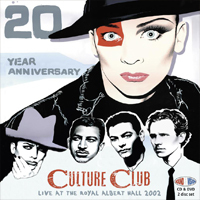 During the summer of 2002 at a historic sold out gig at London’s prestigious Royal Albert Hall CULTURE CLUB, who since 1982 had achieved success on a global scale with the Hits coming thick and fast not only in the UK but also Europe, USA and Japan played to the audience a global jukebox of 20 years of great music. BOY GEORGE said of this historic 20th Anniversary concert “I shouted at the audience “I’m f******* singing a ballad, shut up” and Roy said afterwards “in twenty years you ain’t changed” and howled with laughter. I have often described Culture Club as a living soap opera and I’ve asked friends to tell me never to tour with them again at my lowest moments. However, we have a magic together and this gig at the Royal Albert Hall captures it perfectly”. ...Boy's charisma shines through all of the pieces which also include his solo cuts like the infectious "Bow Down Mister" and gives logic to the raucous inclusion of "Starman", that alien cover in the CLUB canon, in the set. Since then, the original foursome have never appeared on stage, and this fact turns the Albert Hall document, the group's first-ever concert to have been out, into a pleasurable thing of great import. This anniversary performance succeeded in achieving its goals. The twentieth anniversary was indeed observed...the folks in the band were obviously enjoying themselves...and the audience loved it. Who could ask for...anything more? A tense cover of Bowie's Starman and Karma Chameleon raise the bar, bringing the concert to a close on a high note...The extras are good, featuring interviews with George and Moss, a band history written by George, rare photos and footage from the musical Taboo. All in all, it's a good document of a crossroads in the band's history, but we hope it's not the last we'll see of the line-up together.